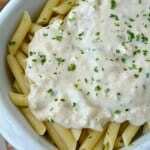 This Skinny Laughing Cow Alfredo Sauce Recipe was easy to make and it tasted so delicious! This is a must try if you're trying to eat healthier and watch your calories! In a medium sauce pan melt your butter and add your garlic and onion and cook until soft. Pour your milk and stir well. Add your Laughing Cow Cheese Wedges, garlic powder, onion powder, black pepper and salt. Stir well. Let your mixture cook for about 15 minutes and use fork or spoon to make sure that your cheese is breaking up while cooking. Using a sifter (or you could mix it with a bit of water first) add your cornstarch to your liquid and stir well. Bring to a boil and then turn down and let simmer for an additional 5 minutes. Add your chives and serve over pasta.